We’ve been doing a lot of live streams lately, and that means a lot of people who need places to sit. Luckily, we got some German designed Epic Series noblechairs just in time for our Cooler Master Modding stream. These fancy looking thrones definitely classed up our studio, and completely dominate standard office chairs. 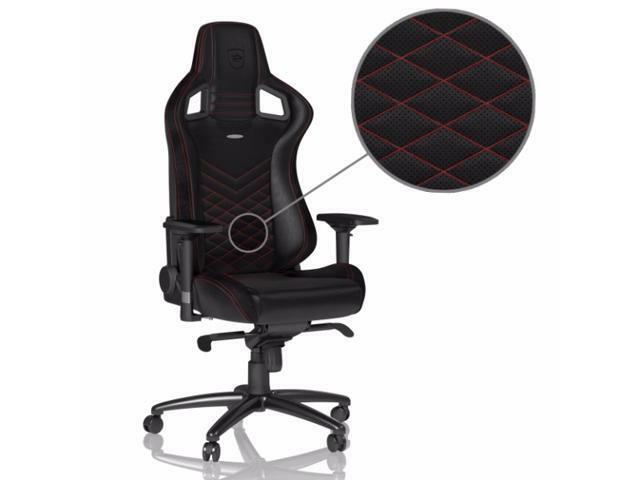 The noblechairs Epic Series is available in a wide variety of colors, and start at $340. The main thing that sets these chairs apart from the very vast gaming chair crowd is the attention paid to design. These chairs look fantastic, constructed with PU imitation leather, fine stitching, and subtle color accents. The idea is to mimic the interior of German sports cars (think Audi, BMW and Mercedes) and, for the most part, noblechair succeeds. These chairs definitely don’t go in the super flashy and loud direction that much of the competition goes for – think less Lamborghini and more Bentley. If you know what BMW stands for, then this is probably the chair line for you. The diamond stitching is accentuated with rough faux velour leather that stretches across the top and sides and feels super nice. According to noblechair, the diamond pattern creates air pockets even in the summer, which supposedly contribute to optimal aeration. We don’t plan on sitting in direct sunlight (or really going outside ever), but I can say that it looks great and is super comfy. These chairs look expensive, and they are toward the higher end, but that’s because of the premium construction. The three we have here at the studio are all part of the same line, the Epic Series, in black, pink, and red. These chairs are pretty much in the middle of the price spectrum for gaming chairs. If you want to spend a bit more and really feel like a baller, you can upgrade to REAL leather, though that’s going to limit your color selection to black or white, and it’s going to cost about a hundred dollars more. There isn’t a huge difference in terms of the design, but sitting on that sweet, sweet cowhide definitely makes for a softer experience. Good looks are cool and all, but when you’re sitting in your chair for hours with a sore back you’re going to quickly stop caring about how your chair looks. Comfort is king, and luckily the Epic Series took that very seriously. The 55% density molded cold foam is firmer than I’m used to, but as someone who sleeps on a futon, that is certainly not a bad thing. The chair is more than wide enough, and even though I’m around 6’1 I never felt too tall. It’s a little on the thinner side though. As is fairly standard with gaming chairs these days, the armrests are plastic and omnidirectional. I wouldn’t be opposed to a softer surface – perhaps some sort of firm foam, or maybe even more (faux) leather? It also comes with a head and lower back pillow that you can put down for a bit more support. It’s a nice addition, but I find that they always end up in a drawer somewhere. I’ve been around for a while now, so I’ve assembled quite a few chairs from across the spectrum. For the most part, the process is more or less as follows: pop the wheels on the metal base, bolt on the pneumatic apparatus with the included hex key wrench, put that apparatus on the base, then finally attach the back support to the base and you’ve got yourself a chair. It can be difficult for one person, but it’s not an especially laborious process. For some reason, noblechairs went with shipping the armrests separately from the bottom of the chair. It’s not a huge deal, but it does mean an extra step in the assembly process, which I could do without. What you’re paying for here is a super classy look. The assembly process isn’t any easier than the competition, and they don’t have any particularly remarkable functions, but they look oh-so-good. I’m a huge fan of the classy, modern aesthetic, and these chairs really hit the spot for me. When I get my next chair for my rig at home, I’m going to be taking a serious look at the noblechairs Epic Series line. The time for me to ascend to a gaming throne has come.